Check out GraphConnect speaker Eric Evans presenting his talk “Case Study Involving Strategic Design and Established Formalisms” at DDD eXchange 2012. 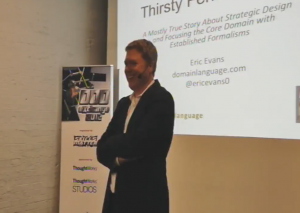 Eric Evans is the author of “Domain-Driven Design: Tackling Complexity in Software” and heads Domain Language, a consulting group helping teams improve their productivity and relevancy through domain modeling and design. Be sure to catch Eric’s presentation at GraphConnect 2012 on applying the strategic Domain-Driven Design to graph databases! For more information on GraphConnect including the recently-announced agenda, go to www.graphconnect.com.